I am honestly so excited about this episode. When Gail first sent me a message asking to be on the podcast I almost fell off my chair. All my Occupational dreams come true! 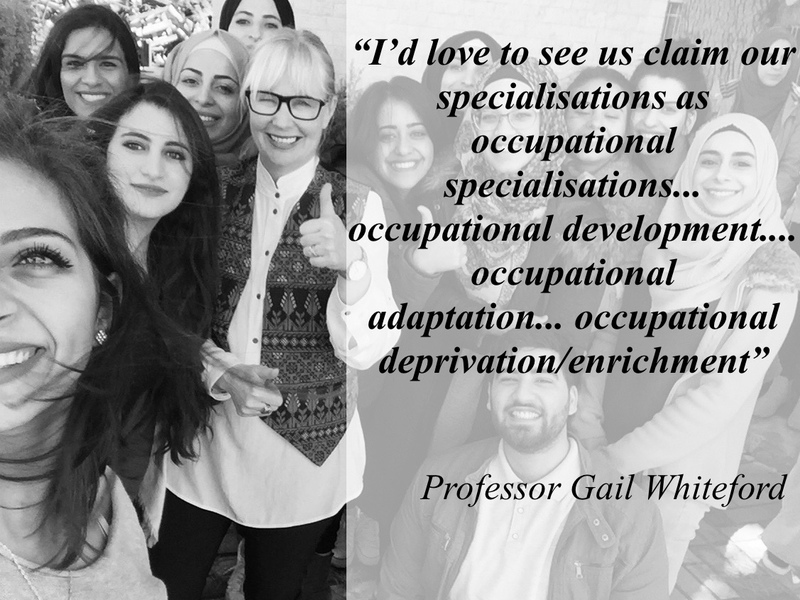 Professor Gail Whiteford has been an OT hero of mine for the longest time and even though we have met multiple times, getting to have a chat with her was a surreal experience. To say I was fan-boying was an understatement. Coming to the conclusion that she is not only one of the most intelligent and well rounded Occupational Therapists i know but also one of the most easy to talk to and engage with. I can’t thank Gail enough for allowing me to pick her brain. Professor Whiteford’s work has had a significant and lasting impact on the direction of the profession and Occupational Science. In particular her work with Dr Elizabeth Townsend in the development and promotion of the Participatory Occupational Justice Framework was something that resonated with me from the core of my OT beliefs. Being involved with OT organisations such as OOFRAS and working with some marginalised populations the framework instantly resonated with the work and professional experiences I had up until that point. Our conversation started with her journey through the profession and the evolutions of OT she experienced throughout that time. Gail, on the spot, came up with ideas I would never have ever considered about the profession. Blew my mind wide open. Feel like im still processing it. We discussed the POJF and how it came into development. The current state of Occupational Therapy as well as what the future may hold for the profession. Definitely one of the deepest, most reflective conversations I’ve had and I really hope it blows your mind as much as mine.